CCA Kids Blog: It's Giving Tuesday! Today provides you with an opportunity to start the holiday season off on the right foot by donating to CCA this Giving Tuesday. You may have started your Christmas shopping on Black Friday and continued yesterday, on #CyberMonday, but today you can give back! 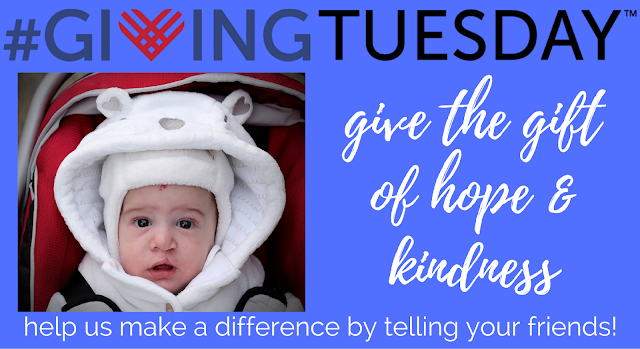 Today you can give the gift that keeps on giving to CCA families and kids that need your support through programming and trips to quality medical centers and hospitals for treatment of their craniofacial differences. You can also send a family to our Annual Family Retreat & Educational Symposium, where many kids see others that look just like them, for the very first time. It is a very powerful weekend. With your donation, you can make the retreat weekend in Reston, VA in 2017 possible for a family. Please share with us today the gifts of good health, acceptance, and love. Three things that never go out of style! And don't forget to let others know you donated to CCA on social media by using the hashtag #GivingTuesday.